Due to the limitations of the platform, first-person-shooters are not a common sight on DS. Indie developer Renegade Kid is one of the few out there to fully take advantage of the lack of competitors, but is Dementium good enough on its own merit? Dementium begins with a commonly overused starting scenario: you have no memory of who you are or why you are in a dank and sinister hospital – a hospital into which you have just been wheeled; not to mention why there are monsters lurking all about the place. The first clues you gather may imply that you murdered someone to have ended up in this foreboding place. Who or what will only be revealed later in the game. 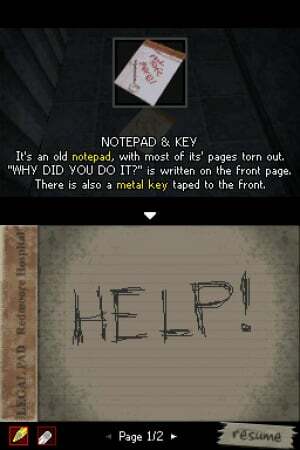 This could have made for an intriguing quest for further clues – a journey of discovery – but, unfortunately, the plot really doesn't go much from there, limiting Dementium to random notes scattered in odd places. That leaves us with the fairly normal makings of an FPS, with just an added layer of unease – not quite horror. While Dementium may not be all that scary, it sill does a great job of maintaining a creepy atmosphere. You may jump a time or two, especially when playing late at night, but it's unlikely that you will find anything here to scare your socks off. At the start of the game you will be greeted by a repeating emergency announcement, which indicates that something went horribly awry in this institution, and the strong beat of your heart pounding your ears as you begin your exploration. The dank corridors with their raided shelves, scattered items, blood stains all around, and the whole sense that the building is devoid of life adds greatly to the tension. The latter part may not be entirely true though as you soon will encounter your first enemy: a zombie of sorts, with bulging-out eyes and an open chest cavity where you can see its still-beating heart. You'll also soon discover incubators in which reside slugs with razor-sharp teeth where babies should have been. Not exactly the nicest of welcome committees. Armed only with a baton and a flashlight you might feel a bit vulnerable at first, yet as you progress you gain access to a more varied armament… only to be met with nastier foes for which the former is needed! The available weapons range from a 9mm pistol to a sniper rifle, with our favourite being the electrical buzz-saw that requires none of the limited ammo that is scattered around the hospital. 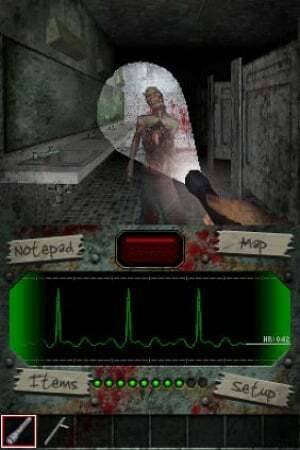 Speaking of which, this game is not for trigger-happy people, as you'll soon find yourself out of ammo – which is absolutely necessary to dispatch some of the creepy crawlies. Let these come too close and you'll soon find yourself six feet under, in several parts. The flashlight does add a nice technical feat as it illuminates the hallways when switched on, but without it you can only see a foot or two in front of you, leaving the rest in darkness. Unfortunately (and intentionally so), you cannot use both the flashlight and a weapon at the same time, so you can be sure to engage in some tense close encounters, especially once the much tougher bosses cross your way. We found it best to aim in the right direction with the torch before unloading the guns on whichever nasty had us in sight. Fortunately, the crosshairs will turn red when hovering over a potential target, which eliminates some of the blind firing that may occur. Oh the whole, the graphics are quite nice – even if there are a lot of shades of grey – and the game's framerate never really falters. Dementium is also interspersed with some quite well done pre-recorded cutscenes that help to imbue more of the horror vibe. Yet where the game really shines is the audio department, with its moody background music, the emergency broadcast, children's wails and mutterings, strange whispers, and the ever-present heartbeat, which grows more frantic as your health depletes. This is what really sets the tone for the game, and, without it, it would simply seem more like a generic shooter – totally indistinguishable. Dementium controls quite well too: you move with the d-pad or face buttons (depending whether you're a righty or lefty), you aim via stylus on the touch screen, and you fire your weapons via the shoulder button – it's all fairly similar to the Metroid Prime Hunters control scheme, actually. You can quickly change weapons by tapping your armament of choice on the bottom row of the touch screen. At the same time as having access to weapons, you also can interact with your notebook and the specific floor map (once found) when tapping the bottom screen. The former is for writing down clues or codes – although it won't see much use and feels more gimmicky than actually necessary. The map, on the other hand, works wonders as it only shows you the floor layout, while you still have to do exploration all on your own to see which hallway has been blocked off or which doors are inaccessible. We much preferred this than the game holding our hand like in most FPSs. That said, the game is still fairly linear, with it being almost impossible to get off the beaten path. While this may sound good so far, the game does have some notable issues. There's only a very limited variety of enemies (with some of the same type appearing later on, just a bit tougher): excluding bosses, there are exactly four. Hence, you can count on running across the same-looking foe a good number of times. Add to that the monotony of stalking down hallways and rooms that, for the most part, look much like the ones before them – given it is a hospital setting we might be a bit more forgiving though, as those do tend to look very much the same in real life as well, but not totally forgiving. Oh, and the game is short. Really short. We clocked it at about just over four hours to completion. If you have the North American release you can also be prepared to fight the same monsters which respawn in (most) areas you have already cleared, dwindling down on the existing stock of ammo and health that can be found. Also, while the game saves after passing through any door, it will only truly save should you decide to quit then and there. Should you die that save point is deemed invalid, and you'll see yourself starting at the beginning of one of the sixteen chapters, most of which are tied to a hospital floor. These "issues" have been fixed in the later European release, but it has been reported that this can make the game too easy. Frankly, we prefer the NA release's quirks as it does make the game feel more like a fight for your life as it forces you to be more careful about your decision-making rather than recklessly charging down the hall. 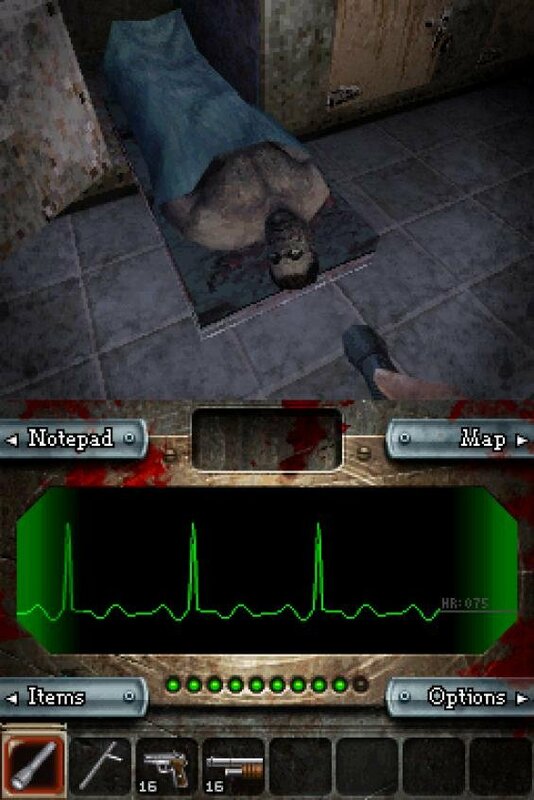 Dementium may not be the greatest FPS experience there ever was, but, for what it is, it is quite an enjoyable romp. It certainly does provide one with one of the best atmospheric settings yet seen on DS. Yes, it may be a short game, but, at this point in time, you should be able to find copies for less. 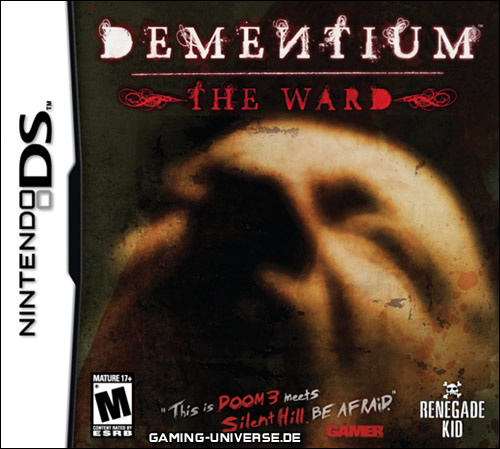 Here's to hoping that Renegade Kid will have learned from its first two games so that (the already in development) Dementium II may see significant improvements over its counterparts. Good to see that the DS is starting to get more of a basis for adult games, and it's nice to see companies put a few more FPSs out there. Great review. Made me think about possibly getting this one - although I must admit that I am a wuss with horror! I'll wait for the sequel where it will likely have a better save system than we got in the US. Played this a while back and I fully agree with the 7/10 score. The game is fantastic and the limited draw distance only adds to the horror feel. This is another DS game I've wanted for a while. I want to pick this up but the sleep disorder kinda makes me stray away from horror genre cause I have a tendency to live the stuff in my dreams. So gotta pass on this one sadly. This game does rock, but it is not better than Moon. The Dementium II trailer is creepy and disturbing. The European had fixes? Frankly, those would have made it worth importing. Restarting a 20 minute chapter is ridiculous. There should have been a halfway point or SOMETHING.